The 10 Most Incredible Theaters in Wisconsin! Wisconsin is a powerhouse for theatrical productions of all types. From plays to classical music performances, Wisconsin lives for housing talented shows in extravagantly stunning spaces. Check out our 10 most beautiful theaters in Wisconsin! The Overture Center for the Arts houses decorated classical music stars, Madison Symphony Orchestra. The Overture Center for the Arts is Wisconsin’s Broadway destination. 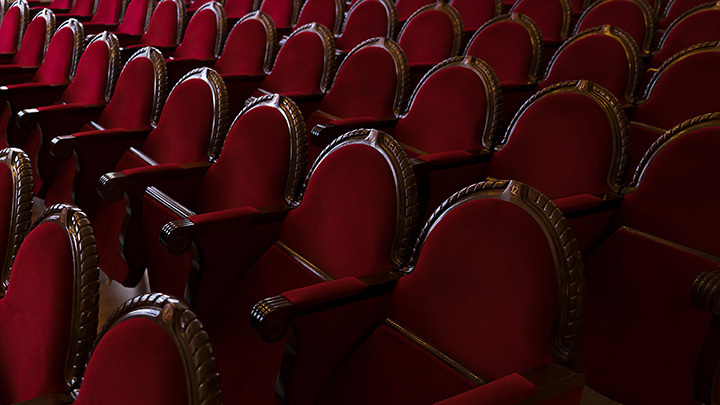 Find luxury in the craftsmanship of the building and its inside, but enjoy timeless shows on the stage. Located in Menomonie, Wisconsin, the Mabel Tainter Center for the Arts is must see for theater fanatics. With their elegant stage presentation and shows it’s no wonder why it made CNN’s 2015 World’s Most Spectacular Theaters. Home of famous acts like the Milwaukee Symphony Orchestra and beloved holiday musical performances is Marcus Center for Performing Arts. Their beautifully constructed building is flawless from the inside and out. Find classical performances and musical gems on the stage of Milwaukee’s Marcus Center for Performing Arts. So close you can touch the stage! Northern Sky Theater is an outdoor theater located at Peninsula State Park. Northern Sky Theater’s produce classical musicals on pop culture heritage topics. This theater is so intimate that visitors are so close that they can touch the stage. American Players Theater is an outdoor performing arts theater located in Spring Green, Wisconsin. Their outdoor theater seats over 1,000 people and aims to educate its visitors on accurately performing classical plays. Its outdoor scenery makes APT a hit on our top 10 list. Historic Pabst Theater located in Milwaukee, Wisconsin, houses over 1,000 people in its traditional proscenium stage. Since its open in 1895, the theater has been a historical landmark for the city and its performing arts. Check out the prestigious history of Milwaukee’s Pabst Theater. The Stoughton Opera House is located just outside of Madison. The theatre has a tremendous amount of history since its grand opening in 1901. After years of roaring applauses the theater has been updated to fill the needs of its patrons, but it’s historic castle-like building (Stoughton City Hall) still stands tall. The University Theater is the University of Wisconsin Madison’s own performing art center. Enjoy spectacular performances put on by both graduate and undergraduate at UW Madison. Their historic theater is absolutely stunning to see in person. Celebrating over four decades in the Chequamegon Bay area, the Rinehart Theater is the states longest running non-profit theater. The theater evolves around the idea of informing, educating and entertaining the community about the performing arts. Enjoy a laid-back theater environment in a quaint brick building located in Ashland, Wisconsin. Dinner and a performance—no way! Known as one of the Midwest’s most popular entertainment stages is the quaint family owned Fire Side Theater. A gift shop, exceptional dinning, and top notch performances updated every season will be sure to win over any theater lover in your family. View more Wisconsin Theaters and Playhouses.